Gurus and Yoga Instructors are those rare beings who have realized their oneness with the Supreme – the highest transcendental consciousness. Gurus have not only realized their true self but also work selflessly to inspire humanity to seek the divinity within themselves. A Guru is able to expedite the progress of their disciples through their close connection to the supreme. Gurus teach the timeless spiritual truths in a variety of ways. Their teachings reflect the environment and period in which they live. Masters may have offered their own unique path towards the highest Truth. However their outer forms may differ, the ultimate realization is the same. Swami Sudhir Anand has been greatly influenced by these great gurus. Baba Ramdev (born as Ramkrishna Yadav in Haryana) is a spiritual leader known for his contributions in yoga, Ayurveda, politics and agriculture. He is best known for popularising yoga among health-conscious Indians through his mass yoga camps and televangelism. 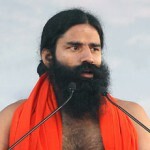 He founded the Patanjali group of institutions. Yogacharya B.K.S. Iyengar (Guruji) is a living legend who teaches yoga in a unique way to all of his students. He finds the meaning of the yoga sutras by his practical search and regular practice of yoga. This has helped him to bring the experience of the wisdom of the yoga sutras to all. His style of teaching yoga is called Iyengar Yoga and is now being followed by certified teachers around the world. Sri Pattabhi Jois was born in an ancestral village called Kowshika, near Hassan in Karnataka state on a full moon day in July, 1915, on Guru Purnima Day. Jois continued to teach at the Ashtanga Yoga Research Institute in Mysore, now located in the neighbourhood of Gokulam with his only daughter Saraswathi Rangaswamy (b. 1941) and his grandson Sharath (b. 1971), until May 18, 2009 when Jois died at the age of 93 from natural causes. Swami Sivananda Saraswati was born in 1887 in the town of Pattamadai, Tamil Nadu. After serving as a medical doctor, he renounced his profession and came to Rishikesh and was initiated into Dashnami sannyasa in 1924 by Swami Vishwananda Saraswati. He toured extensively throughout India, inspiring people to practice yoga and lead a divine life. In 1936 he founded the Divine Life Society in Rishikesh. Swami Rama was born in the small village of Toli in the Garhwal Himalayas in 1925. From an early age he was raised by his Master Madhavanada Saraswati in the Himalayas where he had become the lineage holder of the Himalayan Masters tradition of Sankhya Yoga. Under the guidance of his Master, Rama traveled from monastery to monastery and studied with a variety of Himalayan saints and sages, including his grandmaster who was living in a remote region of Tibet. Rama is especially remembered as one of the first Yogis who allowed himself to be studied by Western scientists. He was examined by scientists at the Menninger Clinic in the 1960s. They studied his ability to voluntary control bodily processes (such as heartbeat, blood pressure and body temperature), that are normally considered to be non-voluntary. In later years he founded the Himalayan Institute in US and in India. Adi Shankaracharya was born in Kaladi Village of Kerala around 788 AD. Adi Shankaracharya was the first philosopher to consolidate Advaita Vedanta, one of the sub-schools of Vedanta. He believed in and was a major advocate for the greatness of the holy Vedas. Not only did he infuse a new life into the Vedas but he also advocated against the Vedic religious practices of ritualistic excesses. He founded four Shankaracharya Peethas in the four corners of India. The Peethas continue to promote his philosophy and teachings to this day. The biography of Adi Sankaracharya reveals that he was also the founder of both the Dashanami monastic order and the Shanmata tradition of worship. Born in Calcutta in 1863, Swami Vivekananda was inclined towards spirituality and God realization since his childhood. Swami Vivekananda came to Ramakrishna while searching for a man who could directly demonstrate the reality of God and became his disciple. Ramakrishna taught him Advaita Vedanta and that all religions are true, and service to man was the most effective worship of God, in 1897 he founded the Ramakrishna Math and Mission. Swami Vivekananda is considered a key figure in introducing Vedanta and Yoga in Europe and America. He is also attributed with raising interfaith awareness, bringing the status of Hinduism to that of a world religion at the end of the 19th Century. He is best known for his motivating speech that began with “sisters and brothers of America”, through which he introduced Hinduism at the Parliament of the World’s Religions at Chicago in 1893. Born in Tamil Nadu in 1916, Swami Chidanada Saraswati took on a life of renunciation in 1936, and joined the ashram operated by Swami Sivananda in Rishikesh, in 1943. He succeeded as President of the Divine Life Society in 1963, after his predecessor who had founded the Society, Swami Sivananda, had reached mahasamadhi. Sri Sri Ravi Shankar is a spiritual leader and founder of the Art of Living Foundation (founded 1982), whose goal is to relieve individual stress, societal problems and violence. Shankar belief is that every emotion has a corresponding rhythm in the breath and regulating breath can help relieve personal suffering. After realizing Sudarshan Kriya, Shankar started sharing his knowledge with others through the Art of Living course.